Christmas and New Years in the UK? Well, considering that it can be cold and rainy any time of the year in the UK, we figured why not go when we KNOW it’ll be cold and rainy? [thus saving the spring/summer travel for more-likely-to-be-better-weather spots.] Convoluted logic, perhaps, but it ended up working out quite well, thank you very much! 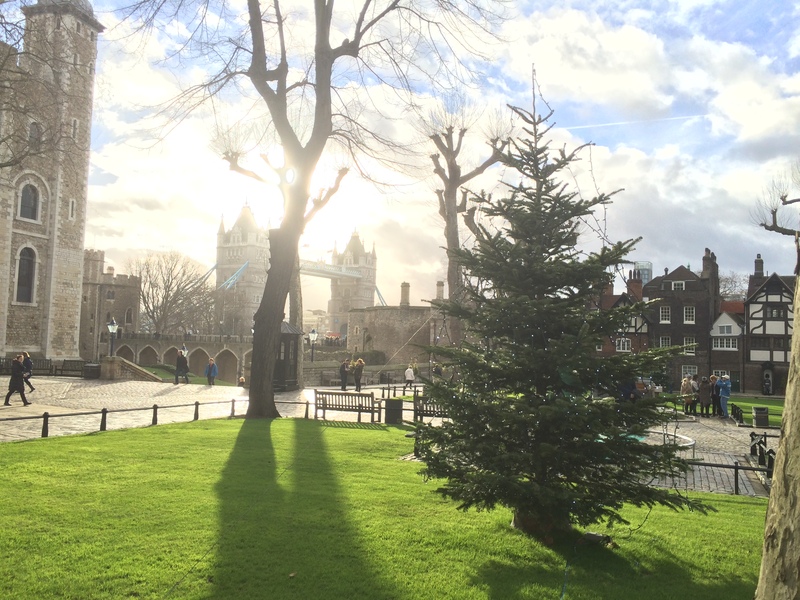 The planning for our first stage of the plan – Christmas in England – got off to a great start when our London-based friends proposed a “home trade.” After a few days together in London, they would fly to Switzerland and stay in our apartment, while we stayed in London. A free place to stay in one of the most expensive cities in the world? Yes, please! For Christmas itself, our English (but U.S.-based) friend Sam invited us to spend it with him at his mother’s house in Exeter (southwest England). At the risk of being intrusive, we accepted enthusiastically. Stage two of planning. After encountering roadblocks (e.g. negative reactions on the TripAdvisor forum, attraction closures), I reluctantly gave up my original plan of heading to Ireland after Christmas. Apparently, no one should even think of being in Ireland in winter. Sam (see above) then suggested we head to Edinburgh, Scotland, for Hogmanay – their New Years celebration. (Thank you, Sam!). As soon as I started investigating, I knew this was the right call. I find it amusing/interesting that somehow even-farther-north-and-darker Scotland is a FABULOUS destination at the same time of year that Ireland is supposedly utterly unbearable. Huh. So, Christmas in England, New Years in Scotland. In a nutshell? Brilliant! Loved! Was it rainy and dark? Sometimes. Was it miserable? Never, not once. Honestly. 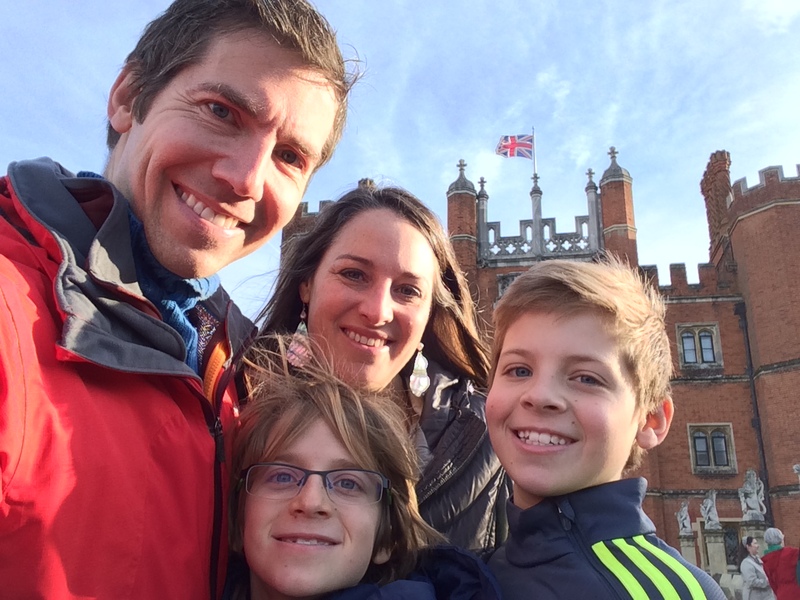 Our first three days in London were so much fun, just hanging out with our hosts – and old friend (American), his fabulous wife (Spanish), and their two boys (English), who got along famously with our two. They showed us a great time. 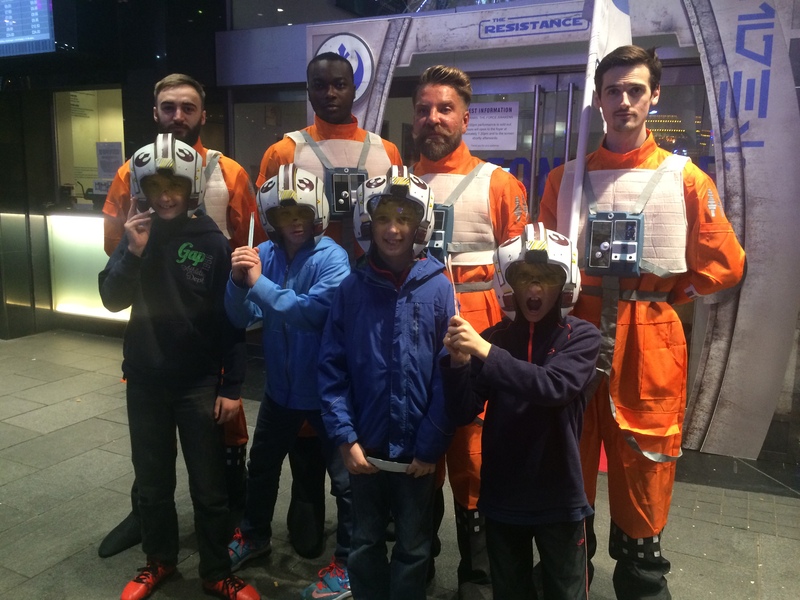 The first night, we went to the new Star Wars movie together at the London theatre that had hosted the premier the night before, so there were Storm Troopers outside, loud theme music playing and a generally festive atmosphere in Leicester Square. 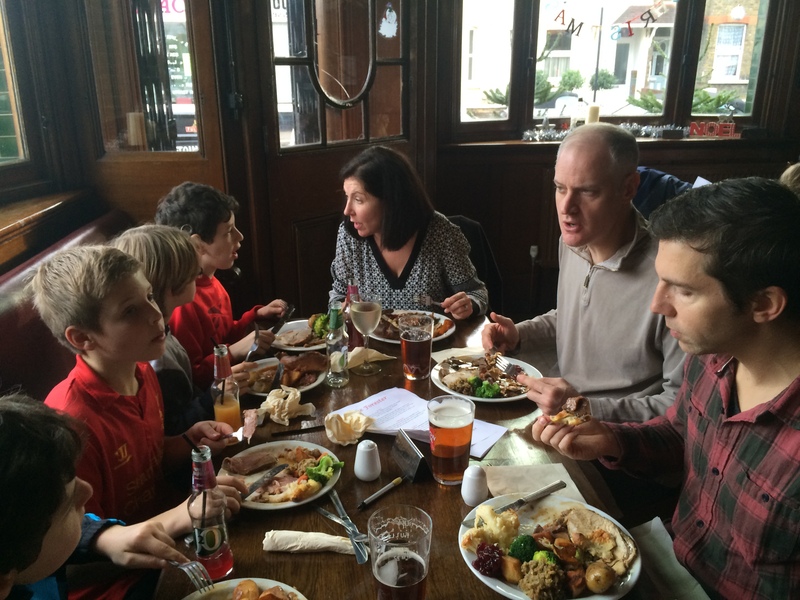 We ate a delicious “Sunday roast” at their local pub. 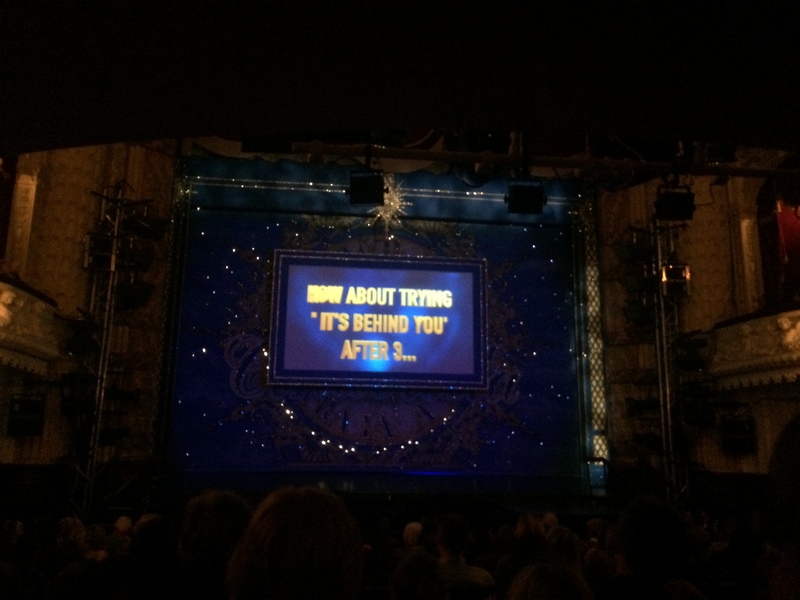 And we even participated in an apparently extremely British tradition: attending a Christmas “Panto,” an English tradition that goes back hundreds of years. For my non-British readers, “pantomime” in England is NOT, repeat NOT, a performance with no words (phew). Instead, it is a VERY silly and hilarious interpretation of a classic play geared toward kids (and above-their-heads humor of the more adult variety) with many moments of audience members shrieking “LOOK BEHIND YOU!!!! !” in response to “clueless” cast members. 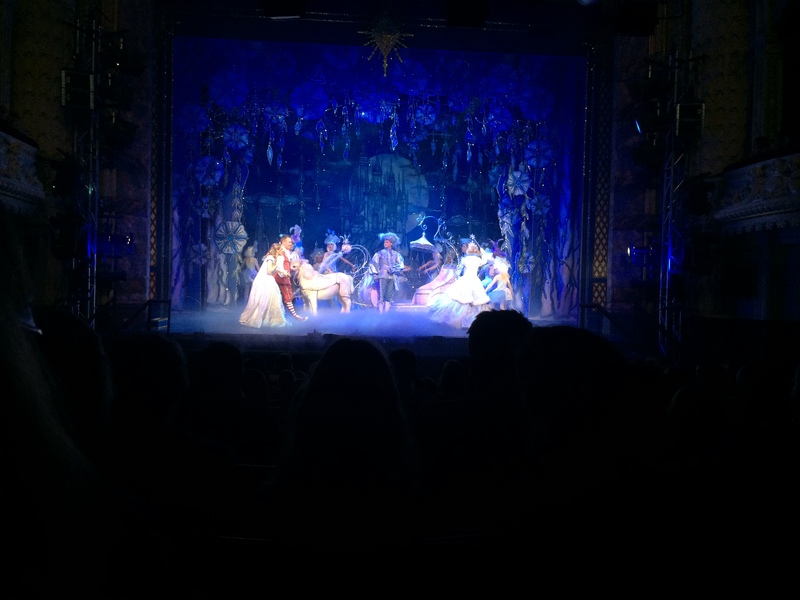 We were treated to Cinderella, complete with surprisingly excellent acting, singing and dancing, truly funny lines, men-in-drag (=ugly stepsisters) and yes, even a has-been B-list actor (sorry, Hayley Mills… I was still excited to see you up there). Really good fun. Sunday roast at the local pub! 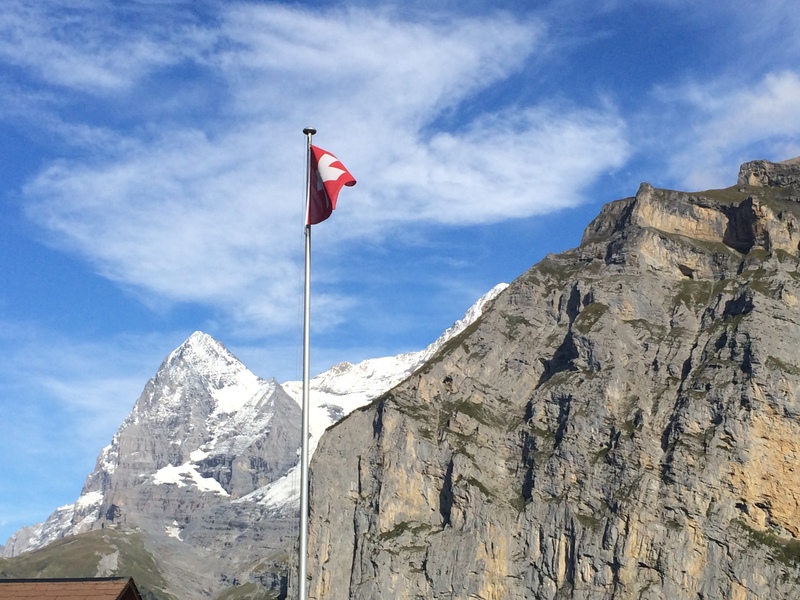 Once our hosts left us to our own devices, we really hit the sight-seeing ground running. First up on the agenda: the Tower of London. This was my favorite thing on my first trip overseas when I was 8. I still love it – a super cool, atmospheric castle right in the middle of London, built in 1078, with a gruesome history and the fanciest jewels I’ve ever seen. The only disappointments this time around were that the famed ravens are now in a cage instead of hopping around on the grass, and the torture chamber is small and only has a couple of replicas – I don’t know if my memory is inaccurate or if it really always has been that lame. However, the crown jewels were cool, and we were wise to follow the advice to make a beeline for the crown jewels immediately after the Tower opened. The boys loved all the armor and weapons. The “Yeoman Warder” (a.k.a. 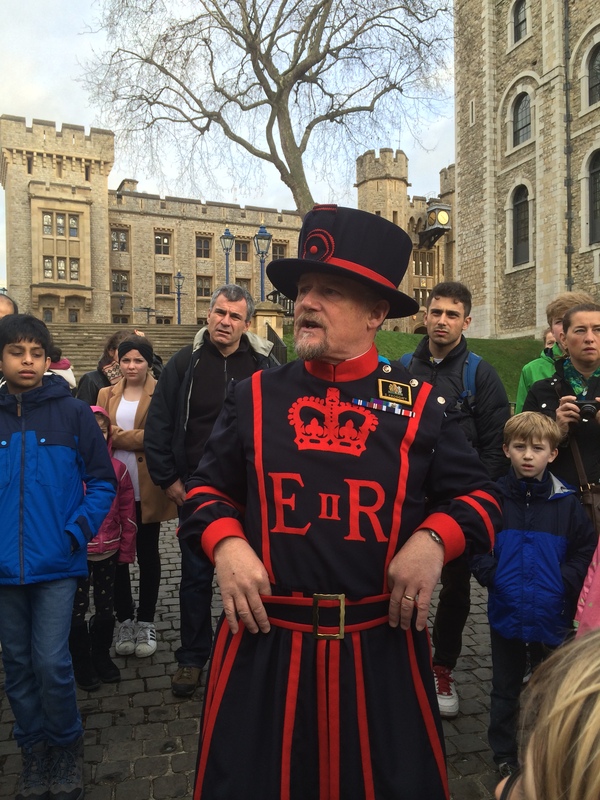 “Beefeater”) tour was also excellent, even though there were WAY too many people on it (75-100 people!). It is free though, and our Yeoman Warder was funny, informative and spoke loudly, so I can’t really complain about it. I love thinking about all the history at the Tower, and some of the bloodier stories really make history come alive (ha ha… sorry, inappropriate?). Our boys are now well-versed in the six wives of Henry VIII and the sad mystery of what happened to the two little princes, presumably murdered by their uncle, so that he instead would then become King Richard III. (I was also moved by seeing the grave of the ill-fated Lady Jane Grey – queen for only nine days, subject of one of my favorite movies starring a very young Helena Bonham Carter and cutie-pie Cary Elwes… a tragic romance, just right for then-high-school-me and my similarly-swooning-friends). 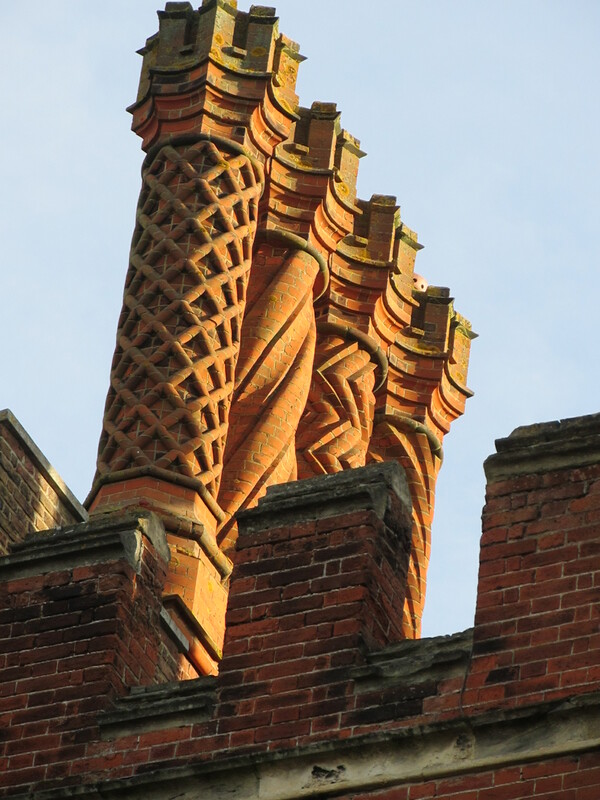 After the Tower, we had a delightful – and sunny! 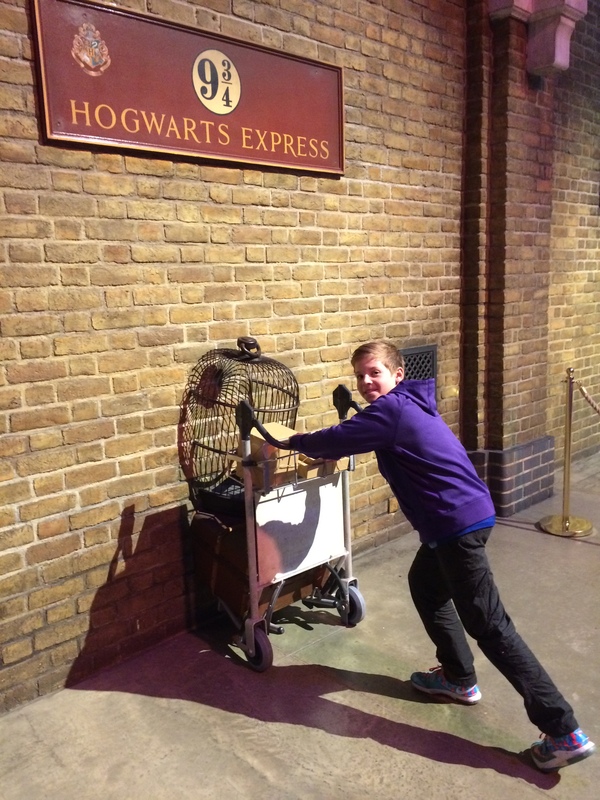 – walk over the beautiful Tower Bridge, along the Thames and through the London Bridge Christmas market to Borough Market (fantastic covered gourmet food stalls)… but this was all just to pass the time until the highly-anticipated “Muggle Tour” (a walking tour of various Harry Potter landmarks). 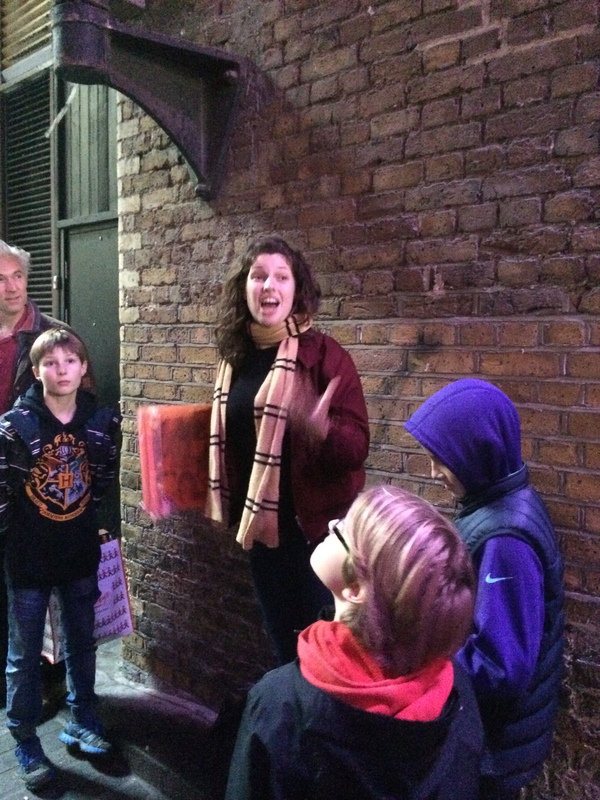 We had a wonderful tour guide – Greta “Granger” – who charmed all of us (and in particular, a certain 9 year old). 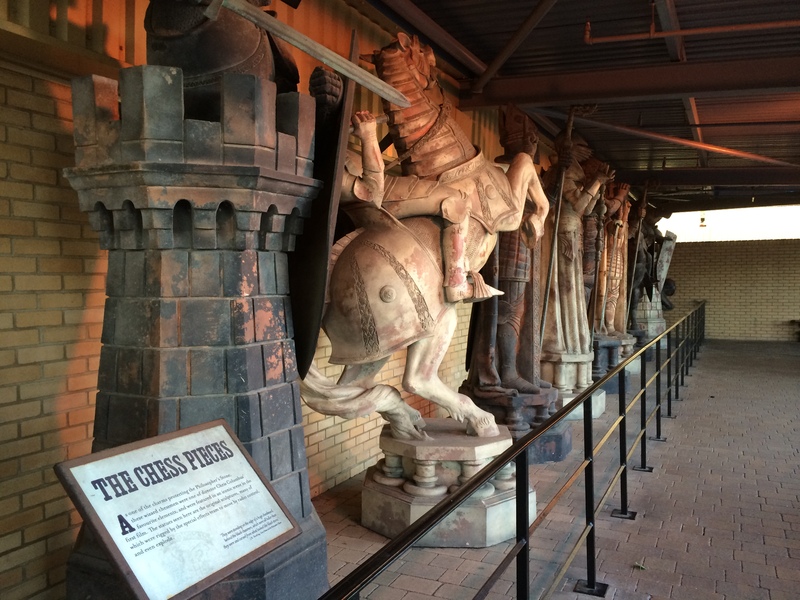 We saw such sights as the inspiration for Knockturn Alley and Diagon Alley, as well as all kinds of other filming locations, and learned lots of good trivia along the way. 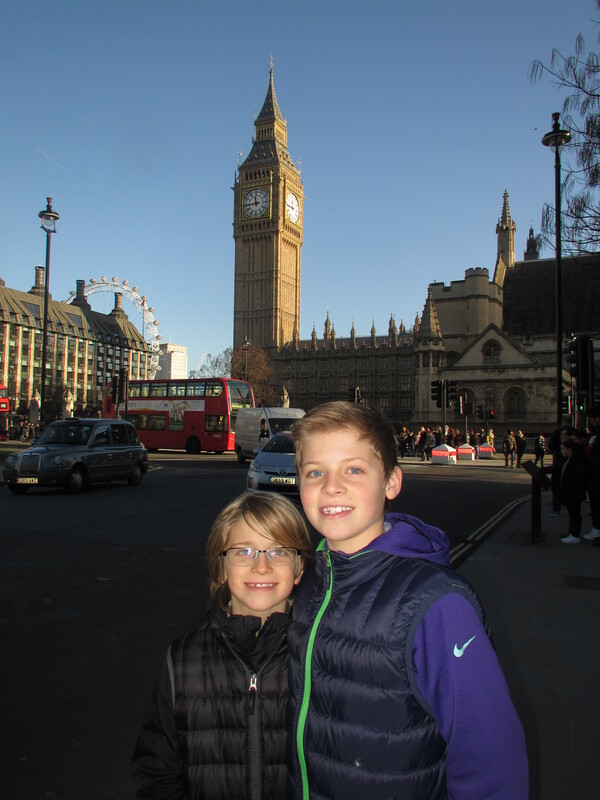 The next day, we went to Westminster Abbey, which was beautifully decorated for Christmas. The kids loved the free kids’ activity – some sort of self-guided treasure hunt. I had a pleasant interaction with one of the Westminster volunteers, who personally showed me the excavations for a new addition, which have unearthed all kinds of interesting items, including a stone coffin that is just sticking out of the side of the big hole. He also showed me some of the more interesting graves (the last non-Abbey-associated person buried there was Laurence Olivier in 1989… who was personal friends with the Dean of the Abbey). After gawking at the adjacent Big Ben, we made our way to the National Gallery (free!). I must say, I was very pleased that the boys were not only engaged but actually went more slowly than we adults did to get a good look at various paintings. 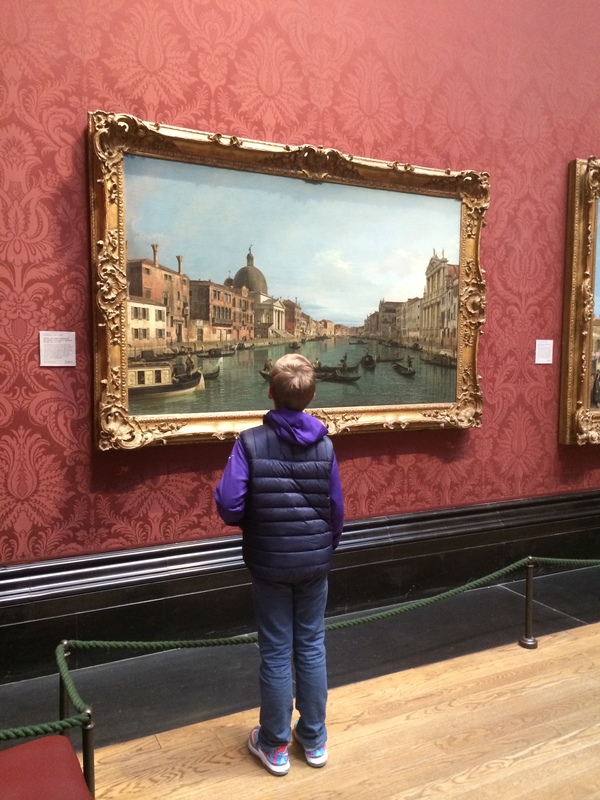 The 11 year old especially enjoyed a room of Venice, Italy, scenes (having just been there in October). We finished with a traditional afternoon tea, complete with cucumber sandwiches and scones with clotted cream. Flouting our hosts’ advice to the contrary (It’s horrible! It’s tacky! It’s a mob-scene! ), we braced ourselves and went to Harrod’s. The boys LOVED it. It is all the things our hosts warned us about… but it is so absurdly over-the-top, it is still fun to visit (for a limited time and only if you go in knowing what you are getting into). It reminds me of Las Vegas – horrible, offensive, why-the-terrorists-hate-us… but still somehow impressive and fun if you take it with an ocean-worth of salt. 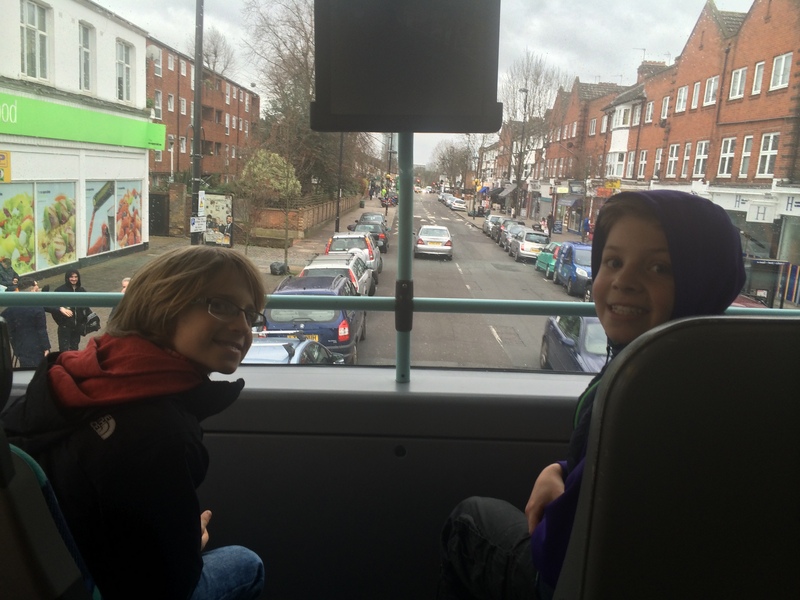 For the boys, it was a thrill ride (and we didn’t even have to buy anything!). On Christmas Eve, we drove our rented car (why must all the Brits drive on the wrong side of the road??? 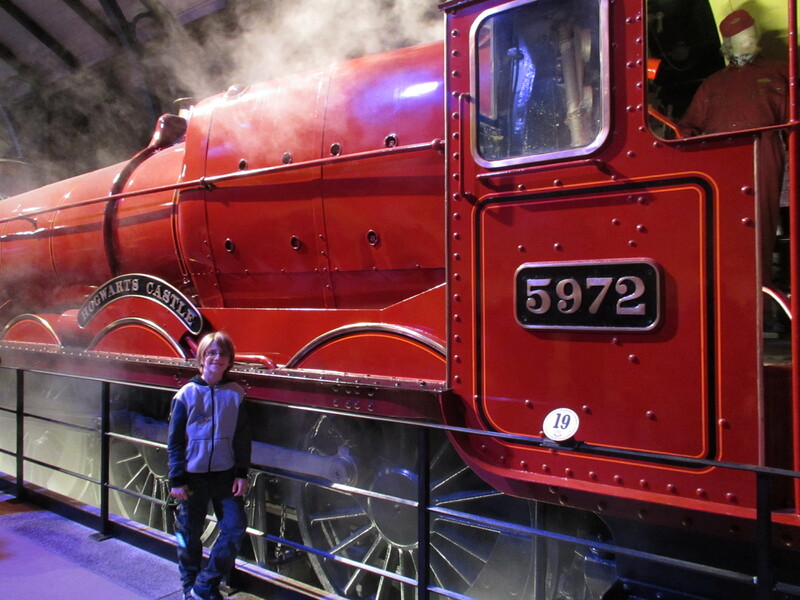 It really makes roundabouts quite nerve-wracking) to Warner Bros. Studios, which now hosts a truly outstanding Harry Potter studio tour (self-guided), where all the movies were filmed. 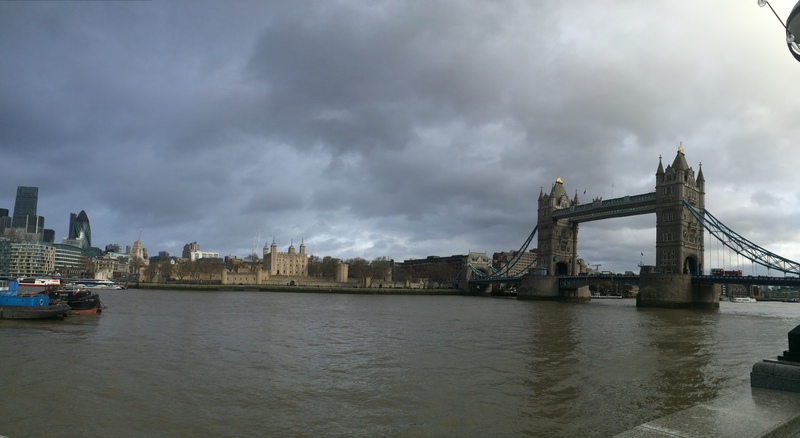 It’s about 45 minutes from central London, which is a bit of a hassle, but it was AWESOME. We spent almost five hours there. Highly, highly recommend (advance reservations required; get them for as early in the day as you possibly can, because it only gets more crowded as the day goes on). We headed straight from the studio tour down to Exeter, a 3.5 hour drive that included a cool, silhouetted view of Stonehenge just after sunset. 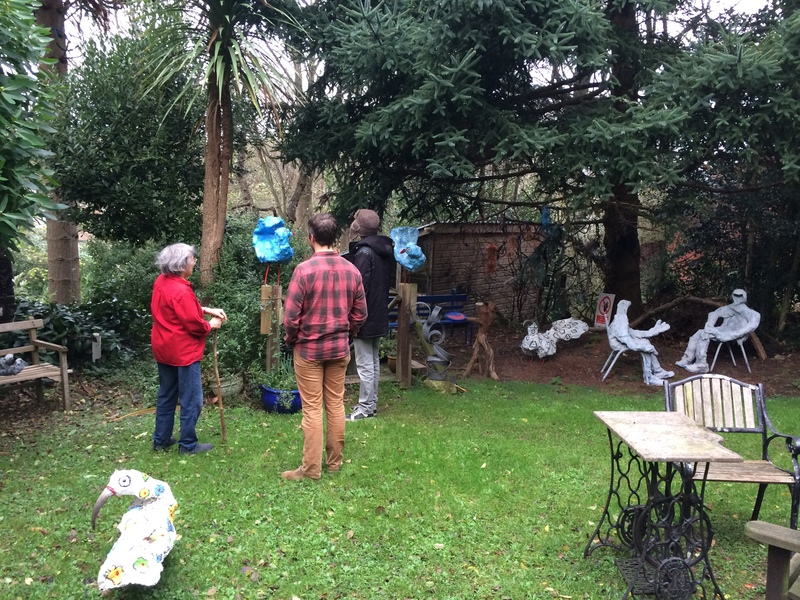 We arrived to the warm embrace of Sam’s mother’s home and artists’ retreat. Veronica welcomed us with open arms and a glass of wine, making us feel right at home immediately. We were all smiles for our whole stay there. 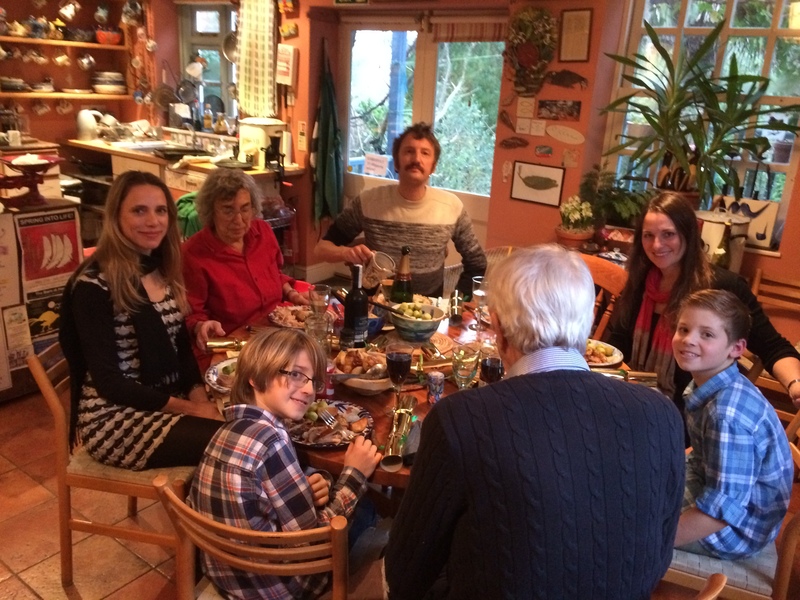 Veronica, her friend Gordon, Sam, his sweet Dutch friend, and we Hatches ate delicious food (lamb with mint sauce and Yorkshire pudding one night, turkey with stuffing, bread sauce and gravy the next – and bread pudding with brandy sauce and mince pies for dessert – wow! ), drank excellent wine from their special family cellar, and laughed a lot. 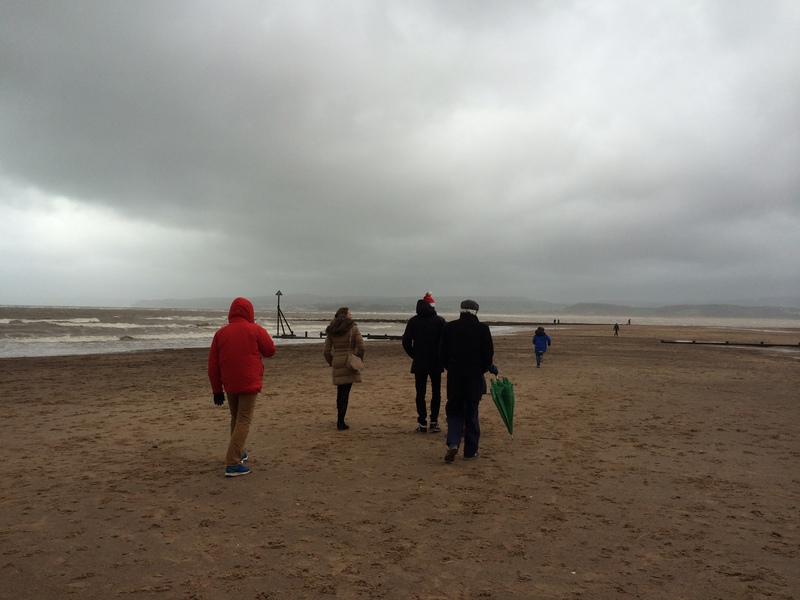 We all opened gifts on Christmas morning and later went for a blustery but fun group walk on nearby Exmouth beach. Veronica’s art is whimsical, wild, creative, funny and fun – her personality winks at you through her quirky sculptures in the garden, on every step on the staircase, on annotated newspaper clippings on the bathroom walls, Warhol-esque lampshades featuring repeating images of Sam and illustrated kitchen drawers and shelves to assist attempting-to-be-helpful guests in putting dishes away. We left reluctantly on Boxing Day to return to our sight-seeing ways but cherishing the homey respite. Passing through the Cotswolds on our way back to London (encountering a few Chinese bus tours, who seem to be following the Rick Steves path…), we managed to make to Oxford, yet another Harry Potter site (although apparently there are other reasons for its fame?). 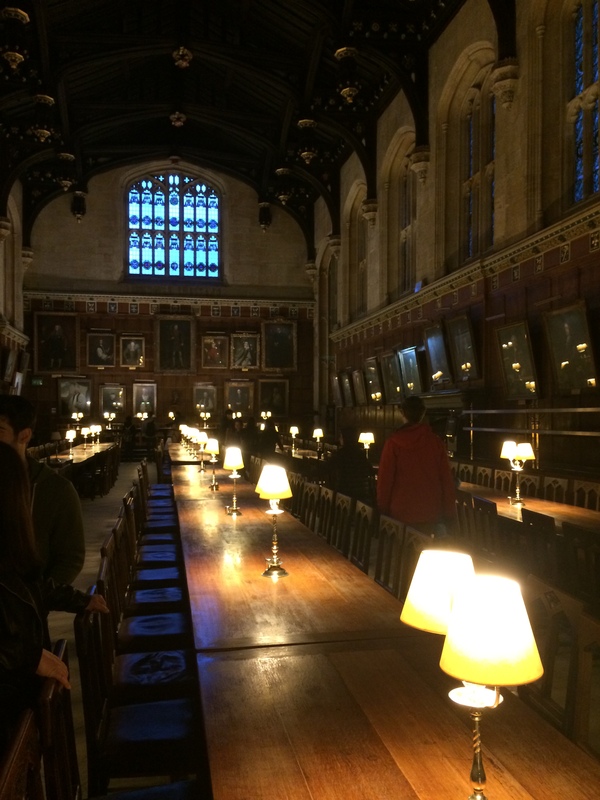 Hogwarts’ Great Hall in the books and movies was inspired by the Dining Hall in Christ Church College. Aside from the woeful lack of moving portraits and floating candles, it is a beautiful and impressive place! 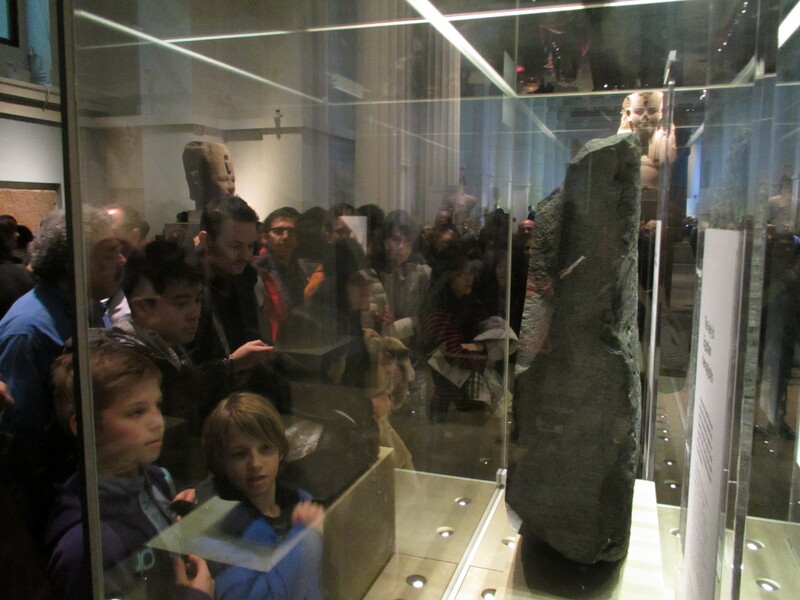 Back in London, we put on our Good Student hats and went to the British Museum. 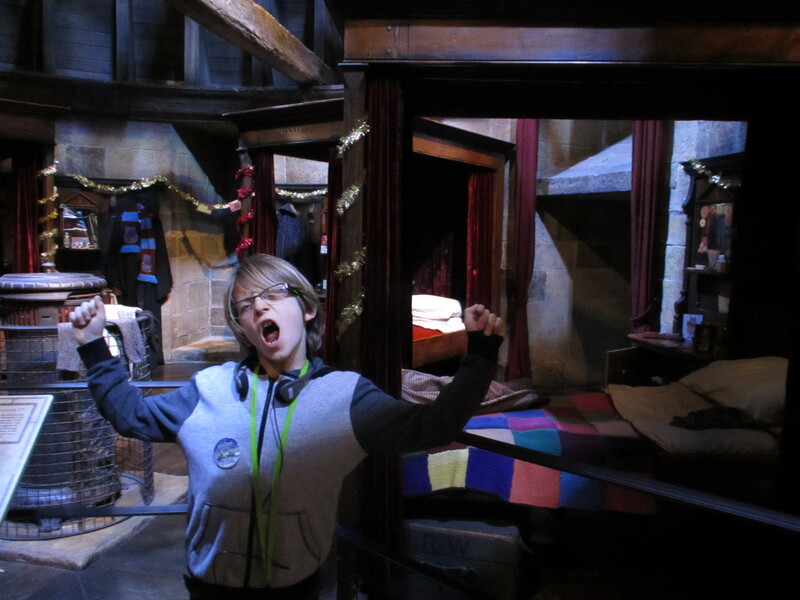 I was not in the right frame of mind for this museum, which (although free – yay) was PACKED and overwhelming. I will say (ahem) that this was a day I was lenient in my drill sergeant ways, so we got there after lunch at peak crowd time (ugh). We hit the highlights (Rosetta stone, Elgin marbles, mummies) and got outta there. In the end, perhaps we could have been better students. My takeaway: A Lot of Stolen Stuff. Our last day before leaving for Scotland (see UK, Part II: So Lochy! Hogmanay in Scotland), we took the double-decker bus to Hampton Court, which belonged to several kings among others (the most famous being King Henry VIII). Fantastic choice for our last day (sunny again!). This palace (not a castle – palaces are built for leisure, not for defense) achieves a perfect balance of making it fun for kids (and adults) without being too cheesy/silly. Kids can borrow a period tunic to wear over their clothes for the duration of the visit. An audio tour (kid or adult versions) is included with the entrance ticket, and it’s quite good. The Tudor Kitchens have lively demonstrations of actual cooking and explanations. We saw several (free!) 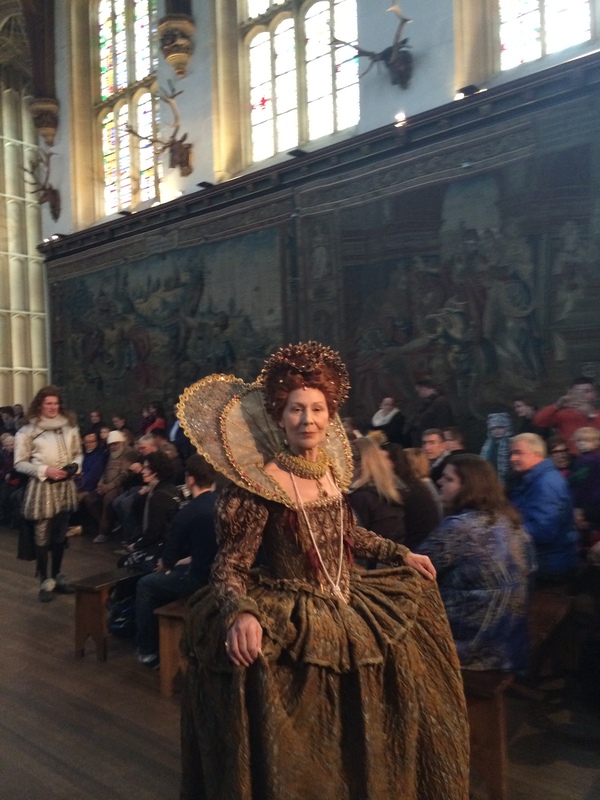 performances that were entertaining and really added to the historical/period atmosphere, including a presentation of Christmas gifts to Queen Elizabeth I (e.g. 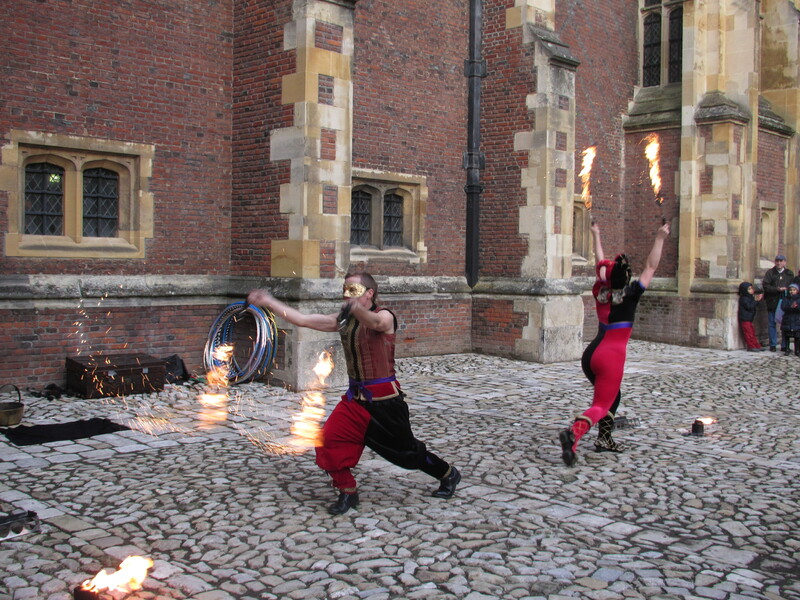 dances, singing) and court jesters juggling and hula hooping with fire. We spent all day there and still felt we could have seen more. A highlight from my own 8-yr-old-trip remained one this trip as well – getting lost and then finally finding the middle in the hedge maze. Perhaps the oddest feature we encountered (at the bottom of a staircase with no one else around) was a creepy little girl whisper, seemingly out of nowhere, repeating “Divorced, Beheaded, Died. Divorced, Beheaded, Survived.” This is the mnemonic to remembering the fate of Henry VIII’s six wives, and once we discovered the source of the whisper (a speaker behind a random door), we laughed – all more relieved than we care to admit! 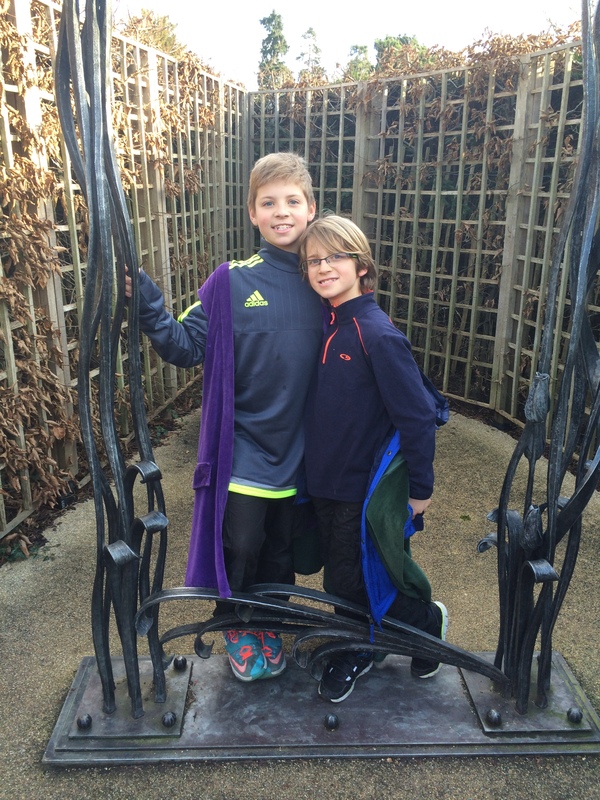 Center of the hedge maze! I must say, we were quite pleased with our choice of England for Christmas! Unconventional, perhaps, but I would recommend it for those willing to risk the weather – just dress accordingly, and I bet you’ll find yourself pleasantly surprised by some glimpses of sun. 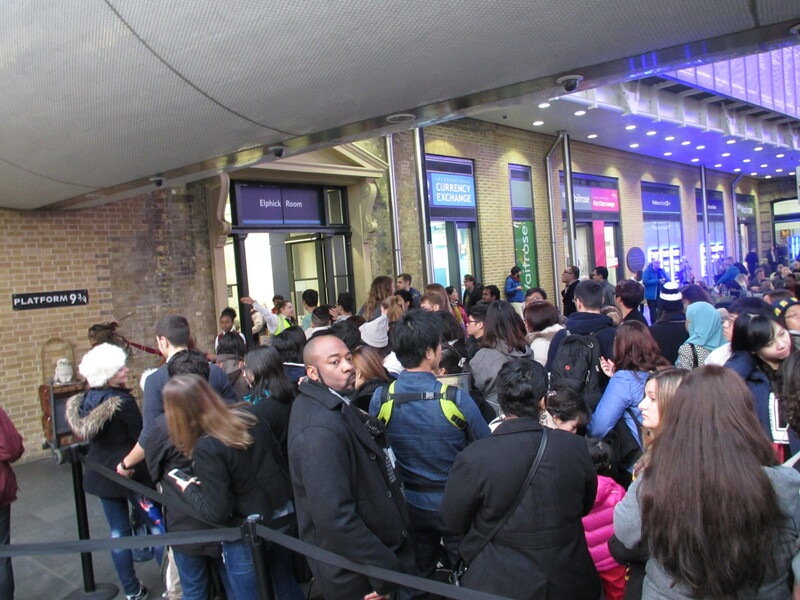 Platform 9 3/4 at King’s Cross (note all adults in line). NOT worth it.